When Books Ireland founding publisher, Jeremy Addis, announced publication was to cease in late 2013, the Wordwell team couldn’t bear to see this wonderful publication disappear and took over its production in early 2014. The ‘new’ Books Ireland is now available in both print and digital formats and is enjoying a new lease of life with a full-colour format, a layout revamp, a move to bi-monthly publication and a recently launched mobile app. It celebrated its 40th anniversary in March 2016. Books Ireland is committted to the publication of responsible critique of literary output in Ireland and offers a unique insight into the latest trends and developments in the Irish book world. Each issue contains a series of reviews, from indepth two-page features to shorter synopsis of all recent titles in our First Flush listing. 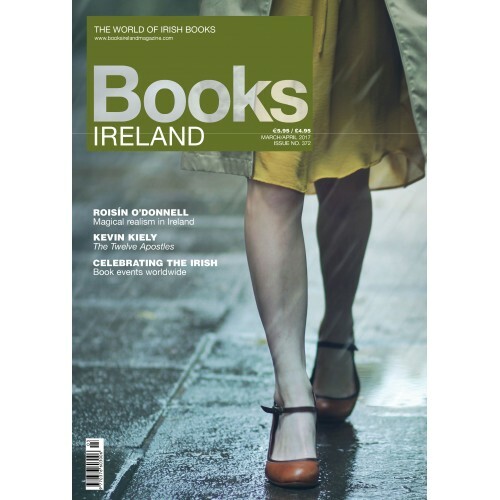 The Book Notes section provides the latest news on festivals, literary awards and our talented contributors leave no page unturned in their quest to review as many new Irish titles as possible within 60 pages. Books Ireland is available in both print and digital format. Get the latest issue straight to your device via iTunes , order an individual print copy for delivery or check out our stockists. Clare O’Dea, who lives in Switzerland, explains the challenges of being an Irish writer abroad. Tony Canavan with the latest news from the world of books. Roisín O’Donnell looks at the new wave of magical realism among Irish writers. Celtic Connections: Caoimhe Fox finds out about Scottish publishers and Irish authors. Caoimhe Fox reports on what’s happening around the globe for St Patrick’s Day. Tony Canavan and Una MacConville find out about the recent collaboration between Irish Academic Press and UCD Press. Una MacConville tells the story of PEN and its importance today. Ciara Regan and Tony Daly talk about their Irish book with a global impact. Tony Canavan looks at the largely forgotten Hungry Hill by Daphne du Maurier. Amanda Bell tells the story behind a book borrowed from Marsh’s Library for over 100 years. Hugh McFadden—The Letters of Samuel Beckett, Vol. IV, 1966–1989, edited by Martha Dow Fehsenfeld, Dan Gunn, George Craig and Lois More Overbeck. Christine O’Neill—Time Pieces: a Dublin memoir, by John Banville. Kevin Kiely—The Twelve Apostles, by Tim Pat Coogan. Anne O’Leary—Through the Barricades, by Denise Deegan. Andrew Doyle—Titanic: culture and calamity, by John Wilson Foster. Tony Canavan—The Crying of the Wind, by Ithell Colquhoun. Anne Cunningham—Humans of Dublin, by Peter Varga. Caroline Hurley—The Making of Molly, by Anna Carey. John Kirkaldy—The Poetry of Vision, by Peter Shortt. Aubrey Malone—A Man with One of those Faces, by Caimh McDonnell. Matthew Farrelly—An Apology for Roses, by John Broderick. Joe Horgan—Madhouse System, by Graham Allen. Sue Leonard picks out the best of new books from début writers. Paula O’Hare finds out what’s cooking in the Irish crime scene. Michèle Callan writes about her favourite time of day for working on a book with her father-in-law.